By law, all workplaces are required to readily facilitate workers of all physical abilities. Despite this law, many offices are designed with very little thought for the day to day needs of workers with disabilities, merely ticking boxes without looking at the bigger picture. 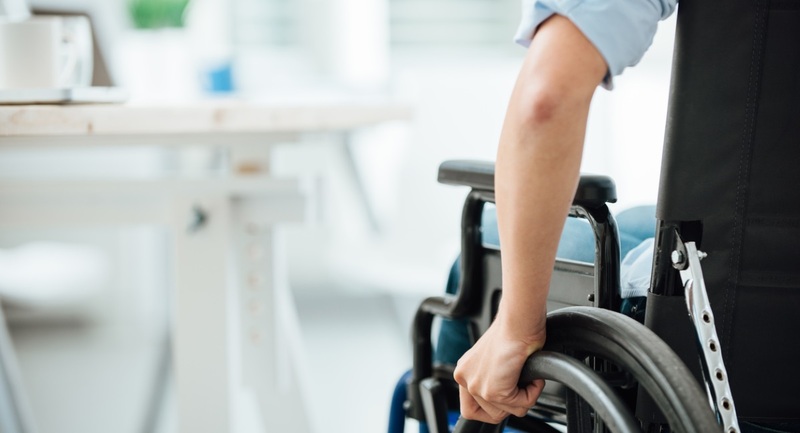 With this in mind we partnered with Shaw Trust to run an independent survey to identify the obstacles that a disabled employee is likely to encounter in the average office. Read on to find out the results and to discover simple changes that can be made to ensure that even the most style conscious office is suited to all workers. Could a disabled employee start in your office right now? See the results! A company can only thrive if it can successfully attract and retain the best possible staff. 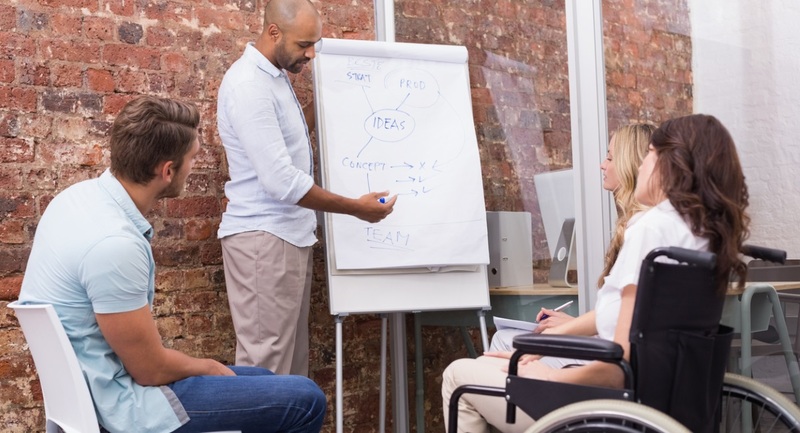 By failing to consider the practicalities required to facilitate disabled employees, companies instantly limit their chances of employing a significant percentage of highly qualified, talented candidates. 7 out of 10 disabled people become disabled during their working lives*. Therefore, an accessible workplace is not only about employing disabled people but is also about retaining employees who become disabled. Could a disabled employee start work in your office right now? If a disabled employee were to start working at your office today, would they be able to get straight to work without any modification to their work space? In the majority of offices the answer would be no, which was highlighted in the survey that we carried out in partnership with Shaw Trust, the national charity that works to help people with disabilities find employment. We surveyed 515 people, aged 18-64 to discover what obstacles someone with disabilities would encounter if they came to work in their office today. Here’s what they said…. Lack of height adjustable desks was the most popular answer across all age groups surveyed. Both men and women were in agreement on this point. The younger respondents focused more on the trip hazards being a problem. 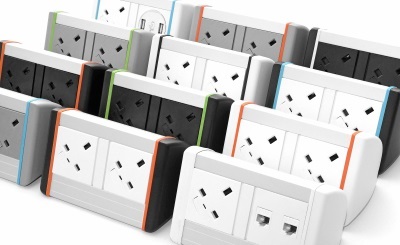 Respondents in the older age brackets rated inaccessible plug sockets as being more of an issue. There are obviously situations where employees with certain medical conditions will require specialist equipment. In most cases, however, disabled workers are expected to either ‘make do’ with standard work stations, or they are provided with basic ‘special’ furniture, which is generally devoid of the style and design that the rest of the office is treated to. Whilst this is a step in the right direction to acknowledging the additional requirements, it is still far from ideal in terms of inclusivity, especially with hot desking becoming common place in many offices. There can little doubt that an inclusive working environment can be a key to enabling many disabled people to enter and fulfil their potential in the workplace. Thanks to recent advancements in technology and ergonomics, fully adjustable workstations allow anyone to arrive at any desk and get straight to work. Height adjustable desks, easily adjustable monitor arms and readily accessible power modules are just a few of the products that can make a huge difference to the workplace, making it easy to create a style conscious working environment that is inclusive to all employees, no matter what their physical abilities. Having the ability to raise or lower the height of a desk can make a huge difference to the comfort of any employee, not least those in a wheelchair. 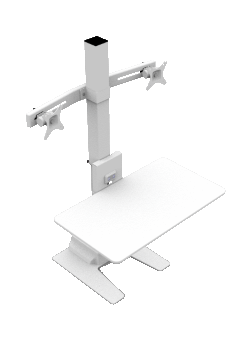 Power assisted, easily adjustable sit/stand workstations can quickly and simply adapt to the working needs of the employer, making hot desking accessible for everyone. Crawling under desks to locate a free plug socket is annoying for anyone, but for those with limited mobility it can be an impossibility. This problem can be alleviated by investing in desk top plug sockets, or modules that fit directly into the surface of the desk. 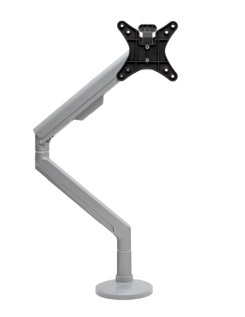 Spring or gas assisted monitor arms can be adjusted by a simple fingertip touch, making them light and easy to position for optimum visibility and comfort. 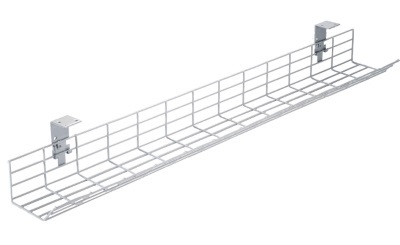 Trip hazards were a concern in our survey, however this can easily be rectified by investing in under desk cable trays or desk risers, to house any trailing cables. Our survey also highlighted uneven flooring as a potential obstacle to disabled employees. This is often caused by cables running under the carpet, which is not only a trip hazard, it can also be extremely dangerous. 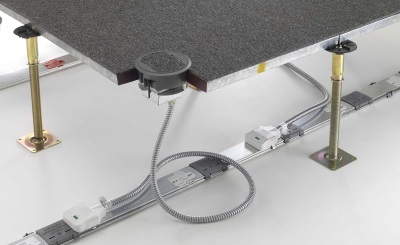 Under floor power busbars create a safe way to distribute power throughout the office, whilst keeping floors flat and even. Poorly thought out workstations that can reduce access to locations and essential business tools. A lack of accessible parking. This can cause stress and anxiety to many disabled people before the working day even begins. Walkways littered with obstructions that cause real barriers and trip hazards for many disabled people. Poorly thought out (or complete lack of) Personal Emergency Evacuation Plans, putting disabled employees in danger and leaving employers open to legal/reputational risk. A lack of thought about how disabled employees can access and utilise welfare provision. No thought into how disabled employees (and disabled visitors) can access meeting rooms. It is a company’s responsibility to take the wellbeing of its staff seriously, and accessibility issues can affect anyone from time to time. It is worth noting that in our survey older workers rank ease of accessibility (easy to reach plug sockets, height adjustable desks and adjustable monitor arms) with a high importance. This leads us to the fact that accessibility can also be a problem for individuals who may not be classed as disabled, however they may still suffer from restricted movement from conditions such as back problems or age related ailments. Likewise, heavily pregnant employees, or those recovering from a mobility related injury may also temporarily have additional accessibility requirements in the work place. With this in mind, far from assuming that special measures need only be put in place for a select few employees, you may find that it is worth looking at the bigger picture and re-assessing accessibility within the workplace as a whole.